Meet the pika, small alpine cousin to the rabbit. The pika lives at altitudes in the mountains where the forest gives way to alpine meadows and boulder fields. Spaces around the boulders provide shelter for the pika, to keep him warm in the winter and cool in the summer. This is a very small, very quick animal, about 6 to 8 inches long, with a big voice. Usually one hears the pika’s alarm call (which sounds like a dog’s squeaky toy) before seeing it, sometimes as just a blur as it races for cover among the boulders. The pika is a busy harvester of grasses, leaves, and flowers all summer long. It makes up to 100 trips per day carrying foliage to its haystacks among the boulders to dry for winter forage. Many of these plants are poisonous. The poisons in the plants act as a natural preservative and decrease over time as the plants cure. Plants with no poisons are eaten first. The least poisonous plants are ready to eat fairly soon into the winter, and the most poisonous plants have lost their toxins by the end of the winter. Ingenious! Wonders of the animal world amaze me! “Alpine Harvest” is composed of 3 alabasters from Utah—Gray, Green and Brown, and Translucent Orange; and 2 marbles—Verde Guatemala and Mongolian Imperial Black. The sculpture required a great deal of planning and engineering since all the stones fit together. I wondered at the task of making the haystack, but was encouraged by my friend, Rosetta, who is a fearless and inspiring bronze sculptor. I drew on what I learned from the making of “Take Flight,” my first complex multi-stone creation, and ventured once again into the unknown. Colored stone and creating colors in stone through the use of texture and finish fascinates me. In this stone sculpture, the most fun was epoxying all the little forms together into a colorful haystack. The blossoms, buds, and leaves are the artist’s interpretation in stone of Fireweed, an alpine wildflower collected by the pika. 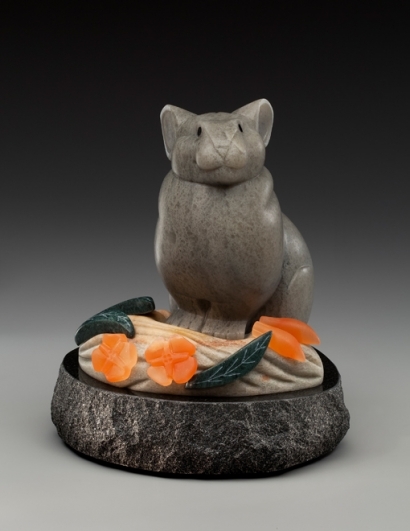 I took the unfinished pika and haystack elements to my show in January at Raitman Art Gallery in Vail, CO, and wet-sanded all the pieces there as a demonstration of (the tidiest) part of my stone sculpting process. Thank you to all the gallery visitors who stopped by to see both my completed sculptures (11 were on display in the gallery) and watch my sanding process. I really enjoyed meeting everybody and talking about stone sculpture and animation. 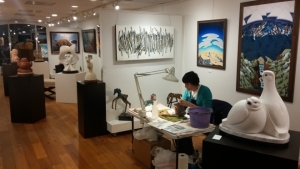 Many thanks to gallery owners Ross, Brian, and Dena Raitman for making the show gorgeous and fun! Many thanks to Christine Gustafson for taking some great photos during the show.